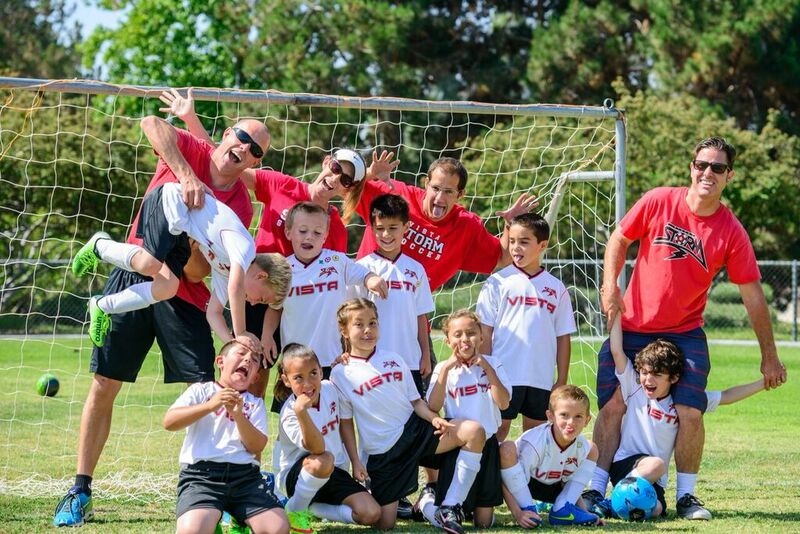 Vista Storm Soccer Club is a non-profit corporation founded in 1982 to provide boys and girls in Vista and the surrounding communities the opportunity to play organized soccer. We’re a member of the California Youth Soccer Association – South (CYSA or CalSouth) and is affiliated with the United States Soccer Federation (USSF) and the United States Youth Soccer Association (USYSA). Our recreational program is for youths ranging in age from 4 – 19 years old. Approximately 75% of our players participate in our recreational program. Assignments to our recreational teams are made using a system whose main focus is balance. We strive to provide an environment of wholesome, competitive fun, developing good character and sportsmanship, team play, and an education in the rules and skills of soccer. Our spring season is 8 weeks long with one practice during the week and a game on Friday and/or Saturday. All teams are co-ed. Our fall season is 10 weeks long with two practices a week and a game on Friday and/or Saturday. Divisions 3 (U14), 4 (U12), and 5 (U10) will have a Play-Off tournament. Divisions 4-6 will draft teams to play an All-Star tournament. One Premier All Star team from each of the Divisions 3-6 will be drafted to represent Vista Storm Soccer Club at a tournament at the end of the season. As the Recreation Season rapidly approaches, there is a critical need for VOLUNTEER COACHES, ASSISTANT COACHES AND TEAM PARENTS. A commitment of a couple of hours of practice a week and two hours each Saturday for games is all it takes. Without a coach, there is no team. - US Soccer Grassroots Licensing courses prior to the start of the season. - Coaching clinics, provided and staffed by our own “Storm” professionals. - Individual assistance upon request. We will be there for you. Can you be there for all our kids? Contact us at dircoaches@vistasoccerclub.org to volunteer today. Nuestros ninos nos necisitan, y tambien el club de Vista Futbol! El registro de la temporadad de Otono llega pronto, y hay una necesidad de entrenadores voluntarios! Es solamente un compromiso de unas cuantas horas por semana, y dos horas los Sabados para los juegos solamente! Recuerde, que sin entrenadores, no hay equipos! Si usted no tene experiencia, no se preocupe! Nosotros le ayudamos! Estaremos en contacto durante la temporadad, dando assitencia necesaria. Por favor ponga se en contacto con dircoaches@vistasoccerclub.org para mas informacion.